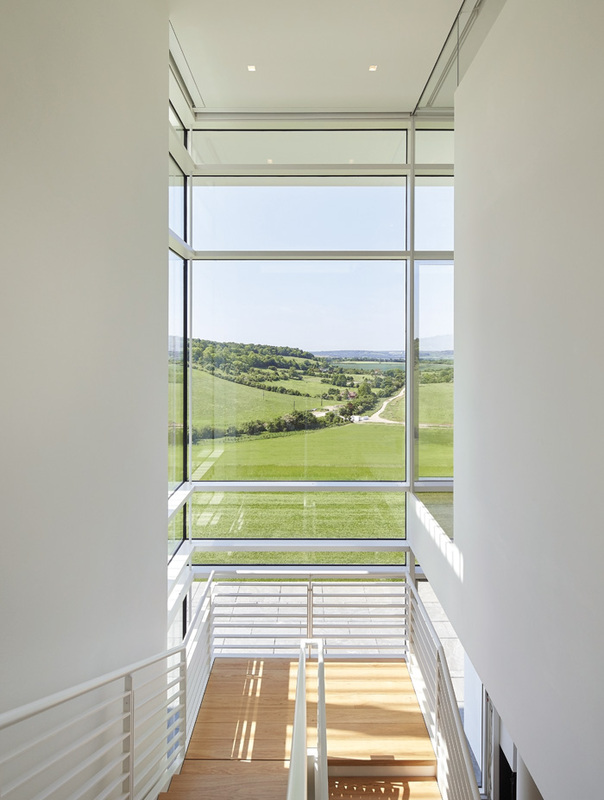 For Richard Meier’s first building in the UK, he has seemed to come across an architect’s dream site — an almost too-perfect-to-be-true plot, set on a gentle hillock with grand, sweeping views across the unspoilt, picturesque Chiltern Hills. If you’re going to make your mark on the English landscape at the age of 82, there’s surely no better place to do it than here. 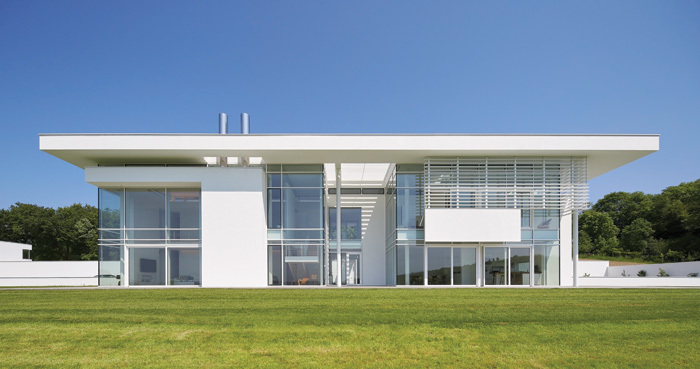 The house is a complex yet modernist composition, and features Meier’s signature white louvres. From afar, the house appears as a long, strikingly white, horizontal plane, anchored low into the landscape and nestled against a forest, like a chalky outcrop that has been gradually exposed to the elements over time. It is a complex yet modernist composition of clean, straight lines and sharp edges — simple building blocks of white render layered with transparent walls of glass and Meier’s signature white louvres. 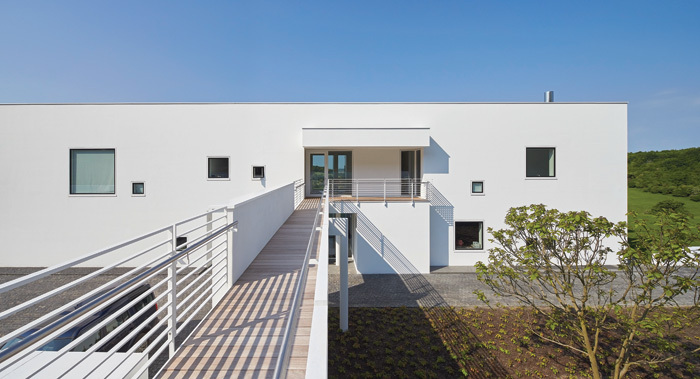 Three slender, shiny, stainless-steel chimneys poke out from the flat, floating roof, while a long, low wall extends to a white cube housing a guest house, concealing a huge garage, tennis court and swimming pool behind. It looks like an elongated version of Meier’s 1973 Douglas House in Harbor Springs, Michigan. Locals first dubbed it ‘a space-age petrol station’ during planning, but now it stands proudly in contrast to the landscape — a pure white silhouette, not completely unlike the neoclassical, white stucco lodges and grand pavilions that were built in similar locations across the English countryside centuries ago. 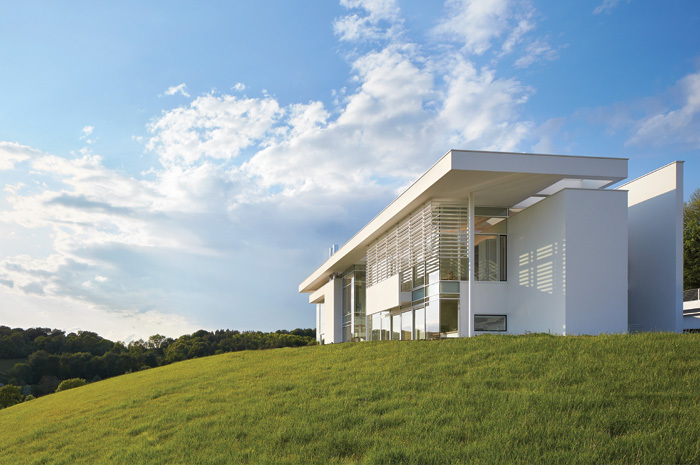 Steadfast in Meier’s pursuit of white modernism, this modern country home is pure Meier too — a commitment to the purity of the aesthetic and the clarity of an idea, and a complete celebration of natural light and space. The new 3,250 sq m home replaces a Thirties’ arts & crafts-style house. It comprises three floors, one at basement level, and five bedrooms. The concept design was presented in 2007, planning was granted in 2010 and construction started on site in 2013, completing in spring last year. London and Oxford-based practice Berman Guedes Stretton came on board after planning to assist with detailing and construction. 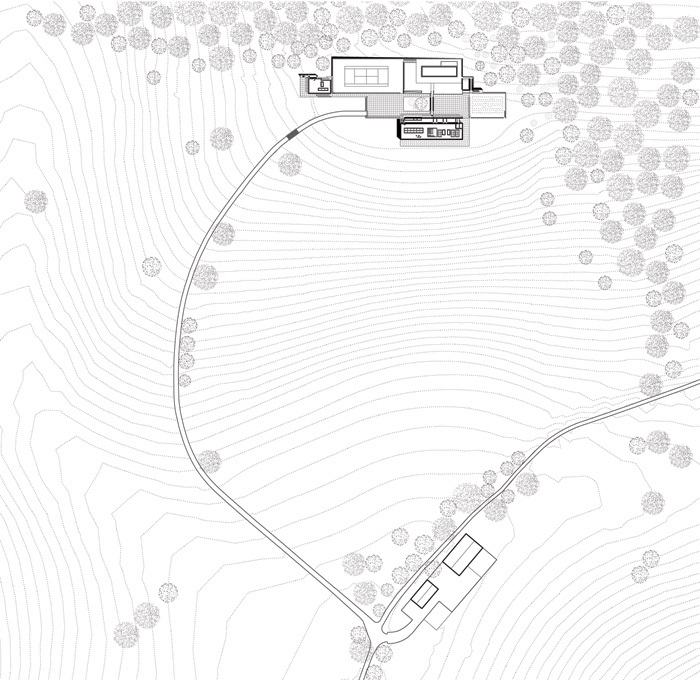 The house is approached through an automated entry gate, a mini-version of the building’s modular proportions, before passing along a sweeping drive, up and around a meadow that was relandscaped to set the house gently into its context at the top of the hill. 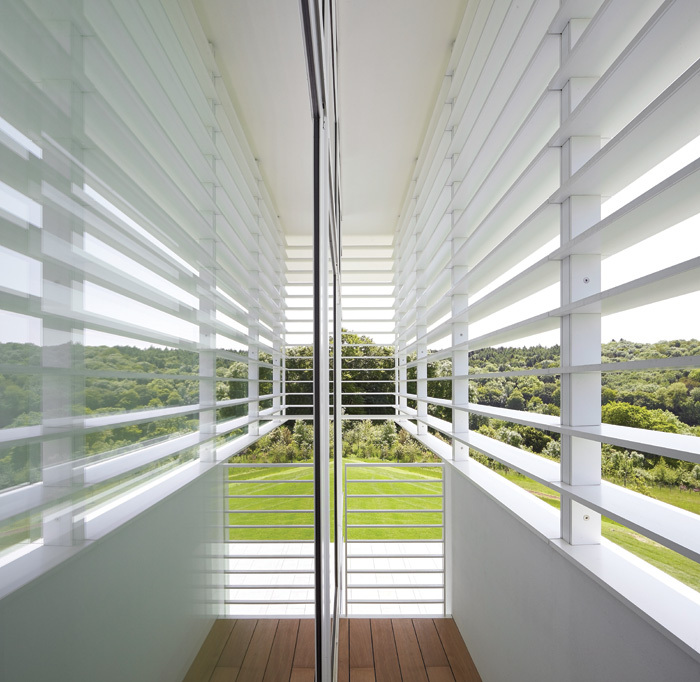 It allows you to slowly take in the best views of the house before passing over a ha-ha and arriving straight into the heart of the long, rectangular plan, with the guest house, tennis court and garage, built into the hillside behind, and the blindingly white house in front with the landscape stretching magnificently out to the south. A small, overhead bridge connects the back wall of the house — articulated as an independent form separated by a narrow band of glazing — to the swimming pool, marking the main entrance below it. Inside, the house is arranged in linear bands along a strong east-to-west axis, with a long, corridor-like space spanning the length of the house at the centre of the plan, from which everything leads off. Instead of being experienced as a great, big, open-plan space, which could easily have become austere and sterile, the building slowly and subtly reveals itself as a series of modest, human-scale rooms with carefully staged views and vistas. On the ground floor, smaller, more intimate rooms — a cloakroom, gun room, office and TV room — are wrapped in dark-wood panelling and situated at the back of the building while lighter, more permeable, public spaces face the landscape. The view resists revealing itself in one go. A small, narrow entryway positions a big picture window opposite the front door, but it’s not the whole picture and there is the sense that there is more to come. Walk around to the right and the ceiling lowers. Here, the landscape ahead is blocked by a solid wall containing a fireplace, creating a warm, snug area with an Eames armchair in front. The space opens on to the highlight of the house: a double-height living space. Its generosity of light and space is heightened by the effect of going from a small space to a very tall one. 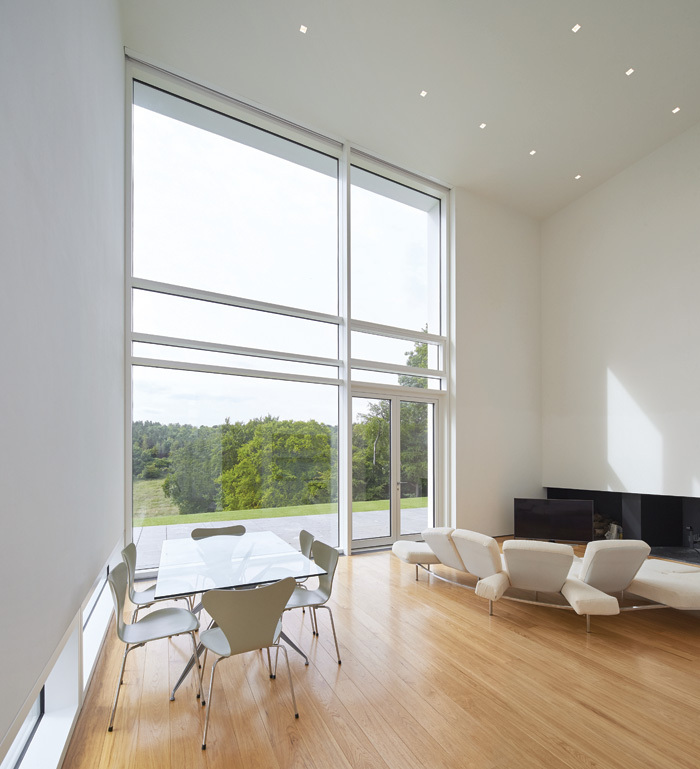 Large windows, modulated by several thick mullions, bring the landscape in. Floor-to-ceiling columns increase the illusion of height. A upstairs balcony looks over the space, while the ceiling appears to hover above, separated from the walls by a clerestory window. The dining room is separated from the living room by a staircase and an indent of the plan. An surprisingly small yet functional kitchen sits at the end, cut off from the rest of the house. 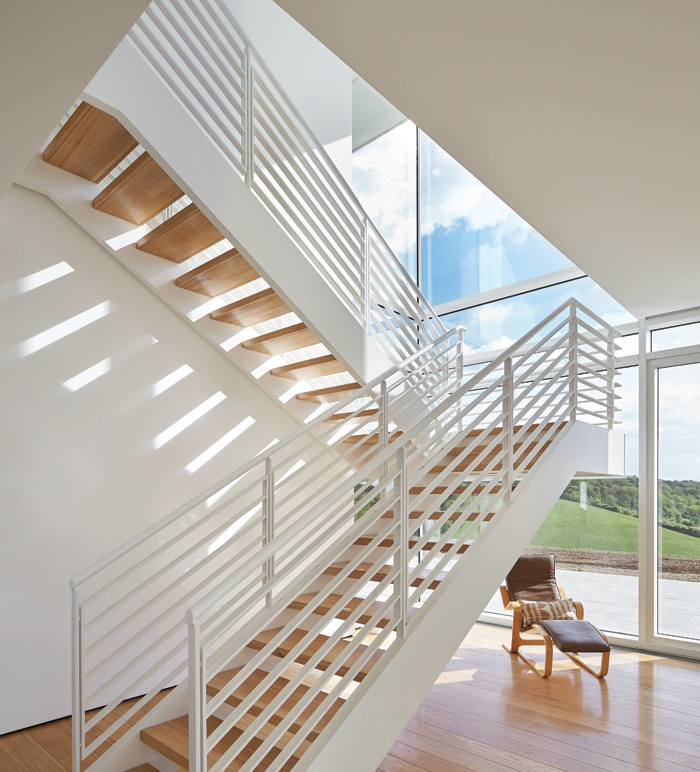 A large portion of the house is given over to circulation — a second, long, elegant staircase at the back of the building leads to the other floors. Downstairs is a laundry room, plant room and storage; upstairs the bedrooms, sheltered for privacy by louvres. 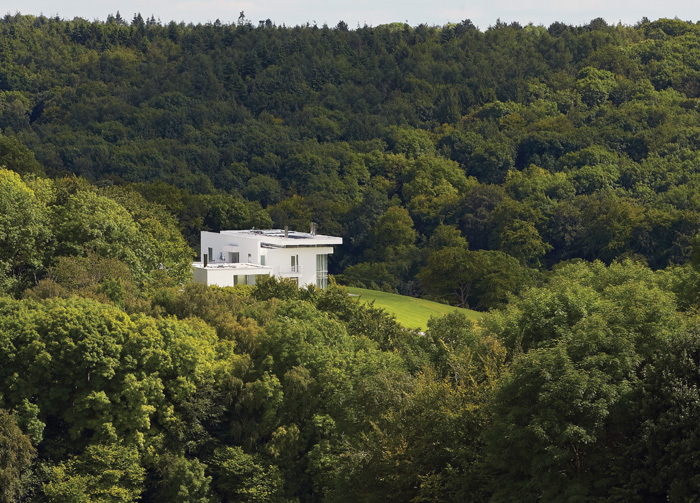 Sustainability-wise, the house is heated by a ground-source heat pump, from some 3km of pipework buried into the hillside. Solar panels on the flat roof of the main house are used to generate heat for the swimming pool and domestic hot water, while automated windows are used for ventilation. The attention to detail is remarkable — the reinforced concrete is layered with a specialist lime render that creates the same seamless white finish inside and out. Everything is custom made, from the door frames concealed in walls to the fitted cabinets and ironmongery designed by Meier himself. There are shadow recesses at the bottom of the walls and American hickory wood floorboards, imported from the USA, are even centred on a grid so they match perfectly where they meet walls and corners of staircases. 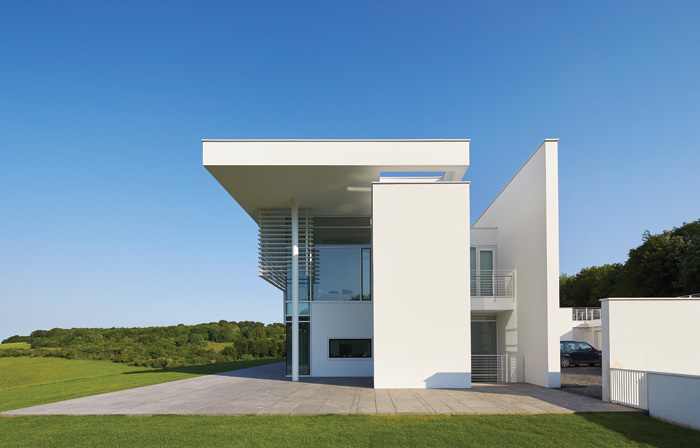 Oxfordshire Residence is a pure, pristine vision in a perfect location, truthful to Meier’s lifelong principles. It has a grandiosity sitting high up on its own hill, white as white can be, but inside it has a nuanced approach to modernism that centres wholeheartedly on the human.